Inconsistent in tone and occasionally boring, Tarsem Singh's updated Snow White fable Mirror Mirror is redeemed somewhat by likable performances and occasional bursts of genuine creativity and humor. The largest problem with Mirror Mirror is that it can't seem to decide what it is. At times it feels like a winking, self-aware, postmodern examination of fairy tales a la Shrek, Enchanted, and Tangled. Then it aims for over-the-top silliness like Ella Enchanted. In other moments it tries for genuine menace and fear, adds some creepy gross-out humor (not vulgar, this is PG after all), then awkwardly shoehorns attempts at touching drama into the mix. There's even a Bollywood style song-and-dance number; entertaining, yes, but jarringly random. Still, in fits and bursts there's fun to be had. As Snow White, Lily Collins (The Blind Side) has genuine charm and grace, especially as her character morphs into a Robin Hood-archetype and grows in confidence. Julia Roberts vamps it up as the evil Queen; her scenes openly fawning over Arnie Hammer's square-jawed prince provide some of the funnier moments in the film. Nathan Lane (The Lion King) and the cast playing the seven dwarves are all game, but the script gives them few chances to shine. Still, individual moments impress: a flirty sword-fight adds some zest and an attack by giant string-puppets is one of the more unique and impressively staged sequences of the year thus far. The wardrobe, cinematography, and set designs are marvelous. If you have little girls, they'll likely love it. Personally, I'd rather revisit The Princess Bride. 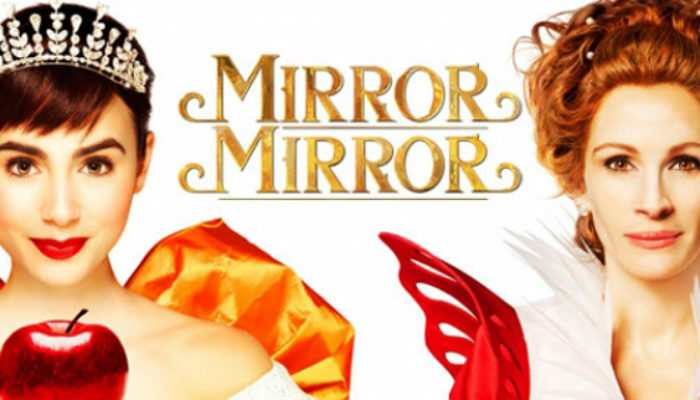 CONTENT OVERVIEW: Mirror Mirror is rated PG. An evil queen ages into an old woman in a creepy moment. There is some comical swordplay and slapstick fights, but no one is killed or seriously injured. There is one mild profanity and some very mild innuendo. The prince is seen with his shirt off. The queen undergoes a “beauty treatment” which involves facial smearing of bird feces and being stung by bees and scorpions, among other things. The heroes are attacked by a monster in a scene that could potentially frighten very small children. MESSAGES TO DISCUSS: You reap what you sow; if you treat others poorly and choose to do bad, you'll ultimately receive misery; if you treat others well and choose to do right, you'll ultimately be rewarded. Confidence comes from caring about the welfare of others, as perfect love casts out fear.